Ted Wright found Europes oldest heavy-duty boat, but it was only in March of this year that scientists confirmed that it dated from as far back as 2030 BC. He died just two months after his archaeological argument, based on a lifetimes work, had finally been vindicated. The 50ft boat, which Wright discovered in 1963, was the shape of a melon slice and had space for 18 paddlers. Made of thick oak planks bound with twisted yew branches, it could have carried metal, furs and amber from the Continent. It has also been suggested that it may have been used to carry stones to Stonehenge. This was the third boat that he had found at Ferriby in East Yorkshire, and it showed that northern Europe four millennia ago was more technically advanced than had previously been believed. Its pretty exciting at the age of 82 to find out that you made one of the most significant discoveries in British archaeology, said Wright. Since he was a boy, Ted Wright had been fascinated by boats, and in 1937 he and his brother were on the Humber foreshore at North Ferriby, near Hull, when they found three large planks sticking out of the mud. They recognised that these were part of a boat, and soon realised that it was a very sophisticated design that must have been created by highly competent craftsmen. Wright remained obsessed by archaeology during the war years, when he was a tank commander. In 1940 he had joined the East Riding Yeomenry as a second lieutenant, but he successfully requested that they stop their training at Sutton Hoo, because it was damaging to practise tank warfare on the Anglo-Saxon burial mound. While on leave in 1940 he found a second boat at Ferriby. Although it was hard to conserve the boats at the time, he visited the site to escape from the grimness of war. In the following years the arguments about his discoveries became his private casus belli. 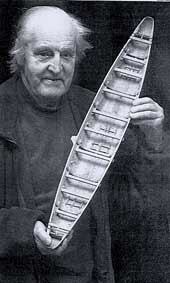 In 1946 Wright endured cold, mud, stench and exhaustion on the riverbank to dig out the two Ferriby boats, a task which he described as like getting slices of crumbly cheese out of glue. He said that it was his experience in the war that enable him to carry out the excavation. The timbers were taken to the National Maritime Museum in Greenwich for study and conservation. After some years the stench from the treatment tanks became so unpleasant that the trustees ordered wholesale disposal, but fortunately some parts were rescued surreptitiously by one of the curators. When Wright became a Trustee of the National Maritime Museum in 1972, he was instrumental in setting up the Archaeological Research Centre, and was given the facilities and encouragement to undertake further investigations into the Ferriby boats. He had spent many years trying to persuade marine archaeologists that the boats were used before 1700 BC, and defended his claims in The Ferriby Boats: Seacraft of the Bronze Age (1990). But it was only in 1998 that scientists began to think that the third boat might have been used even earlier than that. A new dating technique had been developed known as accelerator mass spectrometry, which needed only a small sample of material, and eventually this enabled scientists from Oxford to demonstrate that the third boat dated from as far back as 2030 BC. Wright never lost his enthusiasm for old boats, and a few weeks before his death, despite his fragile health, he held forth to a group of reporters on the foreshore at Ferriby, confirming the point hat he had been making all his life. Edward Vere Wright was born 1918, the son of the chairman of British Oil and Cake Mills. His great-grandfather, Sir William Wright, was chairman of the Hull Dock Company, and laid the foundation stone of the Hull Maritime Museum. After schooling at Charterhouse, Wright read Greats at Christ Church, Oxford. During his first public examinations, he had appendicitis and was granted an aegrotat, and because of the war he passed his finals in absentia. Wright was promoted to captain just before he took part in D-Day, and from Caen he sent home for preservation a fossil that he had found in the wall of a latrine. Soon after D-Day, he fell off a tank and hurt his knee, but he soon returned to action and finished the war as a major. He was later appointed MBE and took charge of the Royal Armoured Corps personnel, but he left in 1946 to spend more time with his boats. In 1947 he joined Reckitt & Coleman, where he became overseas director. On his business trips he tried to establish ways in which other peoples built their boats, and used to bring back samples and models. He wrote the first volume of the companys history. When he died he was helping to write the history of his regiment. He also enjoyed expeditions to find orchids and fossils. Wright was a Fellow of the Royal Society of Antiquaries. In 1987 he and his brother Claude, with whom he discovered the first Ferriby boat, received honorary doctorates from the university of Hull. His wife Jane died in 1993. He is survived by their daughter and four sons. Ted Wright, MBE, Amateur archaeologist was born on June 21, 1918. He died on May 18 2001, aged 83.